Please forgive me in advance for another post about the TSA. I have a lot of processing to do about the events surrounding what happened to me last week, and this is part of that process. When I filed my complaint with TSA about the way they handled my breastmilk, I had to choose a category under which to file it. After lots of deliberation, I finally decided that the most relevant category was "Inconsistent Screening (Different Practices between Airports)". 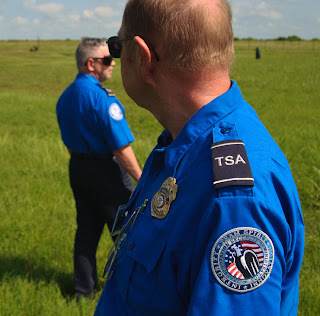 This really doesn't even begin to describe the events that I outlined in my complaint, but it did adequately describe my overall experience with TSA during this trip: very inconsistent. I've heard (and read) many arguments about the new TSA screening practices, mainly arguing whether or not they make us safer. Had my personal experiences with these procedures not differed so drastically from airport to airport, I might be more inclined to agree with those who think the advanced screening practices are an improvement. On this trip, I went through the security checkpoint at two different airports, and I was screened totally differently each time. If every airport behaves this way, and there's no uniformity in screening practices, how can they possibly be detecting and preventing threats effectively? On both of my trips through security, I wore the same clothes and brought the same items with me on the plane (with the exception of the breastmilk on my return trip). During the first screening I experienced, I went through the metal detector (as this airport doesn't have the full-body scanners) as usual, and then was pulled aside for a lower-body pat-down. The TSO indicated to me that I needed to receive the extra security measure because I was wearing a skirt. I submitted to the pat-down and then was asked to move to a different screening area. I had been flagged for an explosive residue test because I had an empty stainless-steel reusable water bottle in my carry-on bag. The TSO who told me why I was being tested for explosive material held up my water bottle, indicating that it was the reason for the test, without explaining to me what was happening. I told him, "It's empty," thinking that he was asking me to dispose of the liquid inside. He had a thick accent and I had trouble understanding all of what he said to me next. He directed me to hold my hands out flat, palms facing up, with my thumbs alongside my palms. He swiped them with a piece of something that looked and felt like a paper towel, and then put it into a machine to analyze the findings. When it came back clean, he helped me gather my things and move to an area where I could reorganize myself prior to departure. By the time I had left the screening area and come back a second time, there were significantly more people in the queue for getting processed through to the gates. At that point, the full-body scanner had been shut off, and no one was receiving the new advanced screenings. Does this make any sense? I know people have complained about how long it takes to get through security when the scanners are in use, but couldn't they have just switched it to every third person? Or every fourth? Why stop doing it altogether? Doesn't that kind of defeat the purpose of having more in-depth screening devices, if they're not going to be used during peak traffic times? One of the things that really gets to me about being denied the alternate screening for my breastmilk is that I believe the x-ray didn't provide as much relevant information to the TSOs as the alternate screening would have. They basically scanned my milk to see if anything was frozen inside it, but didn't learn any information about any chemicals it might have contained. I wish they had offered to perform the same explosive residue test (which I had received at the first airport) on the outside of the breastmilk bags—or, on the milk itself, as I had offered. If that had been done, they would have actually ascertained that my milk did not, in fact, contain chemical explosive material. (Hasn't that always been the issue with liquids—that they could be potentially explosive?) After I finally allowed the TSO to put my milk through the x-ray machine, I passed through the metal detector and was not required to be patted-down below the waist due to my skirt. My reusable water bottle was not questioned at all. I found out later that all three of my other family members had enhanced screening. My mother and sister had opted for the full-body scanner, while my brother received the advanced pat-down. My mom and sister, after going through the full-body scanner, also then received pat-downs from the waist up. Doesn't that seem a little excessive...not to mention, a bit questionable? It made me wonder if no one was even looking at the images created by the scanner, since they still had to agree to pat-downs after passing through it. Basically, I don't understand how these new screening practices are effective if they're not being implemented consistently across the board. Even if some airports have different technology than other airports, doesn't it seem like the same criteria should be used to determine if someone is indicated for advanced screening (wearing a skirt, having a steel water bottle, etc.)? And if the full-body scanners are really generating a virtual naked picture, and there's really someone on the other end of the machines monitoring those pictures, then why should someone be required to submit to additional patting-down after going through? That's all. I simply don't understand. This all just really makes no sense to me. It makes you wonder how the treatment of breast milk would have been at the first airport, and how it also varies from place to place. My favorite (ha) item in your post here is the above-the-waist patdowns for your mother and sister who'd already received the full body scans. How bizarre is that! It's all just security theater. And, since it's bad theater, there is no consistency. I never had a problem getting liquids though, but then again, I always had my baby with me. I always traveled with 100oz of breast milk or formula (I sadly stopped producing sufficient quantities before he was ready to wean), and it was always always explosive tested, as were any food containers. I would have to stand there, holding my baby with one hand and opening containers with my free hand. And that was regardless of what screening method I opted for. My biggest objection was that the places to breast feed my son that I was promised did not exist. I was told by the airline that it would be easy for me to find a "family room" to breast feed. That was a big fat lie. The so called "family rooms" were just big bathrooms, no seating of any kind other than the toilet. Thankfully, I had brought plenty of milk ready to feed in bottles. @Anonymous: I had my baby with me when I took the breastmilk through security, and they still harassed me & denied me the opportunity to have the alternate screening (explosive testing).